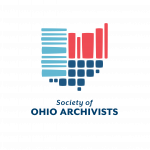 The Society of Ohio Archivists (SOA) is pleased to announce four scholarships available to students (2 awards), and new archival professionals (2 awards) with three years or less experience in the workplace to attend their annual spring meeting on Friday, May 17, 2019 at the Hilton Akron/Fairlawn Hotel. The scholarship consists of conference registration (including lunch), a one-year membership to SOA, and a $100 travel stipend. Awardees are required to submit a photograph and write about their experience for publication in the Ohio Archivist newsletter. Applicant’s name, mailing address, and e-mail address. Applications and inquiries can be sent via e-mail or mail to Devhra BennettJones, Devhra@Lloydlibrary.org Lloyd Library, 917 Plum Street, Cincinnati, Ohio 45202. The awards will be presented at the Society of Ohio Archivists Annual meeting on Friday, May 17, 2019 at the Hilton Akron/Fairlawn Hotel (http://www.akronhilton.com/).